I don’t often put dedicated referrals to other blogs here. If I see blogs on relevant topics, I usually want to implement the ideas myself and write an original post that delves deeper into the mathematics involved. And more often than not, the post I’d refer to shies away from or completely ignores the mathematics (the best part! ), so I feel justified in not referring to the original motivating article. But I recently found an absolutely fascinating blog, and a topic, which is a novel exception. The blog is called Valve Economics, and it’s so intriguing precisely because I don’t know anything about economics, and because Valve keeps all their juicy raw data private. I’d like to take a moment to share it with you. There’s an excellent video game company out there called Valve, which has made some of the (universally accepted) best video games of all time, including some I personally have enjoyed. 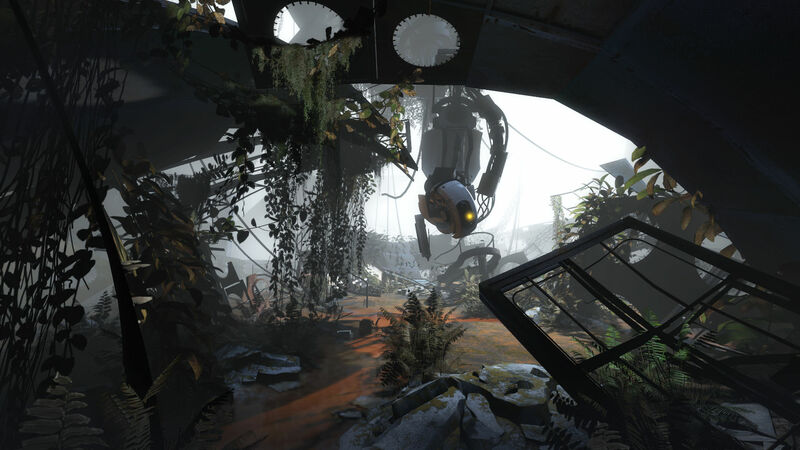 A scene from Portal 2, my personal favorite Valve game. Valve also has a wonderful content distribution network called Steam, which doubles as a platform for their in-game economies. One prominent example of this is their popular online shooter Team Fortress 2. They have what’s known as a barter economy: goods are exchanged directly for other goods, without any universal intermediary currency. Now the thing that makes this economy so fascinating is not what you’d expect. The guns, hats, and glasses and game mechanics are largely irrelevant. The astounding feature of the Team Fortress 2 economy, and that of all virtual economies, is that every single transaction is recorded and saved. Let me isolate that statement, because it deserves a the emphasis. Valve has access to the data of every single transaction ever made in the Team Fortress 2 economy. This opens up a dreamland of possibilities for economists, programmers, social scientists, and a whole host of businessmen. Consider the current state of economics. The world has been experiencing befuddling economic woes. The “Fed”s of the world have been lowering interest rates to encourage lending to no avail. Governments have been spending to encourage a resistant job market to grow. Countries have been clawing through massive heaps of debt, and economists have been speculating about the collapse of the Euro, one of the world’s largest currencies. In the midst of all this economists are more or less at a loss. Classical and contemporary economic models fail alike, and the usual tools to combat recession have been all but exhausted. And, not even considering the recent corruption scandals, banks have not contributed much. One huge factor in the difficulty for economists to conduct a meaningful analysis is that there is simply not enough data. It’s an unavoidable fact of life that many transactions are not recorded. Migrant workers are hired under the table, big corporations reroute their income through circuitous digital pathways to avoid larger tax burdens, and a vast amount of exchanges are simply not available (recorded or not) for economists to use. They are forced to rely on macroscopic estimates and statistical simplifications to predict the future of an increasingly complex system. And so economists measure the growth of most goods-based markets by sampling a “basket” of commonly traded goods and measuring their value. But that doesn’t tell economists what people are buying, and most companies wouldn’t give up their sales data to an outsider anyway. But Valve’s virtual economy suffers none of those ailments. Since every transaction goes through the Steam network (and through Valve servers), each one can be logged, stored, and retrieved at the flick of a SQL query. As an analogy to a real-world economy, imagine if every single container of milk that was ever bought, sold, traded, or given freely (even in, say, the last year) was recorded in a single spreadsheet. It’s ludicrous, right? And that’s just for one product! In the Team Fortress economy, Valve has this data for every one of their many goods. But outside of Valve, and aside from being a euphoria-inducing, data-happy wonderland, what good is studying a virtual economy? I think the answer lies in economic knowledge itself. 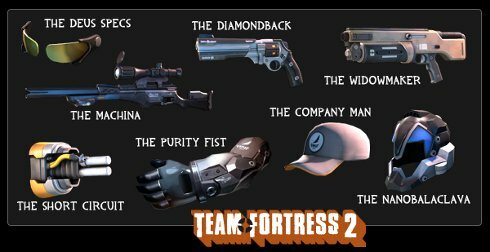 In the Team Fortress economy, the folks at Valve can perform experiments and measure the results. They can provide hard evidence that a particular technique will have a particular effect on their users, and this can provide valuable insight into real world economies. Because remember, these are real people making decisions on the value of various goods. Steam has about 90 million users. At peak hours, there are more than 5 million users playing games, about 60,000 of which are playing Team Fortress 2. Imagine the entire country of Singapore on Steam at the same time, or Ireland, or Costa Rica. Now imagine if the entire population of Flagstaff, Arizona was playing Team Fortress. And now consider the entire country of Germany having Steam accounts. In those reference frames, it’s not hard to imagine the relevance of this digital economy. Valve recently hired a Greek economist by the name of Yanis Varoufakis to analyze their virtual economies, and he’s recording his insights and methods on his new blog, Valve Economics. He’s already shown some fascinating results on the fluctuation of potential for arbitrage schemes. That is, the opportunity for someone to buy cheap goods and immediately resell them for a higher price (a trader’s dream). Moreover, this represents the divergence of an economy from its equilibrium. Finally, it seems that the need for generalized statistical models evaporate once you have all the data. The mathematics and economics he explains is completely elementary, and the need for statistics largely evaporates in favor of large-scale computational techniques (which he only hints at in his posts). The resulting analysis is concise, clear, and elegant. 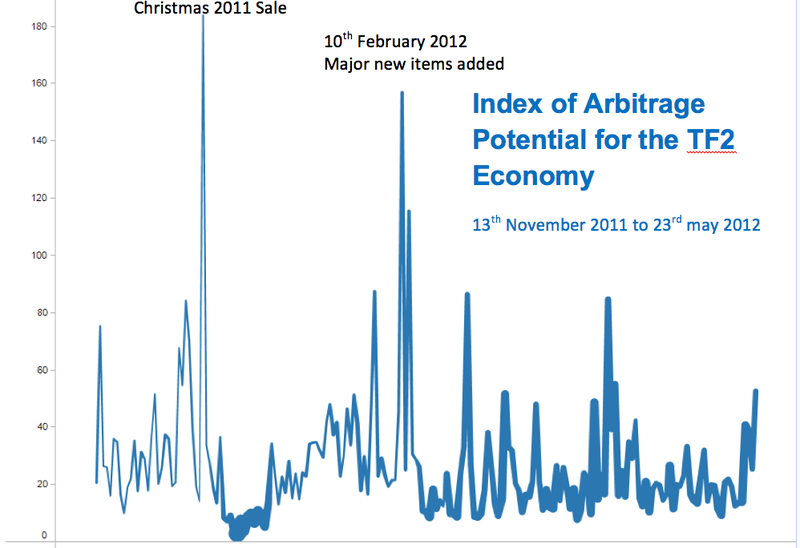 Varoufakis’s graph showing arbitrage potential in Team Fortress 2. Height represents potential for arbitrage, and thickness represents volume of transactions. Varoufakis (a complete stranger to video games) has done a boatload of work in economics, been at the center of the debate over Greece’s debt problems, and now works full-time for Valve exploring virtual economies. Varoufakis provides more details on the structure of the economy in this interview (starting about 33:00) on Left Business Observer radio, where he elaborates on content creation, bursting bubbles, philosophical economic debates, and economic regulation. I highly encourage the interested reader to listen, because he provides many details and analogies that are omitted on his blog. Even with only two posts, I’m hooked. And as long as his posts are, I want more: more detail, more economic background, more history, more on his programmatic methods, more of it all! I’d love to learn more about economics from a mature point of view (and in particular mathematical and computational economics), and Varoufakis presents his work in an accessible, engaging way. But even more so, I’d love to get my hands on these awesome datasets. If any readers know of a good text that would give an introduction to mathematical economics or computational economics, please let me know in the comments. More importantly, if anyone knows of freely available datasets from similarly isolated economies, please let me know! Without data to experiment with the analytic techniques is largely useless. This entry was posted in General and tagged arbitrage, economics, team fortress, valve, video games, Yanis Varoufakis. Bookmark the permalink. The standard (first-year PhD) textbook is “Microeconomic Theory” by Mas-Colell, Whinston and Green (Oxford University Press). For computational economics I am not sure what to recommend, but I’ll go with “Algorithmic Game Theory” (available at http://www.cambridge.org/journals/nisan/downloads/Nisan_Non-printable.pdf). And then there are Elsevier’s Handbook of Mathematical Economics (4 volumes) and Handbook of Computational Economics (2 volumes). Someone should write a program that detects and corrects the rating for users who like math. I’d like to point out that, while this is really fascinating, there are problems with relating the Valve economy to the real world. The gold standard in economics is policy-invariance: we want to reduce the system all the way down to fundamental parameters that won’t change when the government or some other entity changes policies. So we typically describe consumer behavior with a utility function, which is a concise summary of how people rank different consumption bundles (that is, the utility function assigns a higher number to bundles that the consumer will choose over the other bundles, which are assigned lower utility numbers). In economics, it is usually pretty safe to assume that the utility function is policy-invariant: whether or not the government taxes spaghetti does not affect whether people would rather eat spaghetti than hot dogs (but it does affect the relative amounts that they can afford). The problem arises because in computer games, these choice structures are not necessarily policy invariant, because the values of “consumption” to the consumer are derived from the policies themselves, rather than being the primitive object of the system. Whether or not a player would rather have a rocket launcher than a machine gun depends on, for example, how effective each is at killing characters, which is something that Valve could change at any time. (Now it may be possible to model the behavior by supposing that the objective is to maximize kills or flag capturing or whatever, in which case the hit points could be modeled as policy, but this would be very hard, computationally, and unlikely to match actual behaviors) More over, the introduction of new weapons could completely upset the entire existing choice structure, and again this is something that Valve could do at any time. So as with all experimental economics, be very careful in interpreting your results. But these are all things which “could” happen, but have not yet and may not ever happen. The game is getting quite old as it is, and I doubt a lot of ground-shaking development will be introduced any time soon (as opposed, say, to designing a sequel instead). I think the real benefit is that one can perform as close as possible to perform a controlled experiment; the Valve economy is a closed system. Doing this is simply unthinkable in any form of economics as we know it in the real world.